It’s that spooky time of year again. The time when ghosts and goblins come out to play and smiling pumpkins light the way. Is your house ready for the festivities? 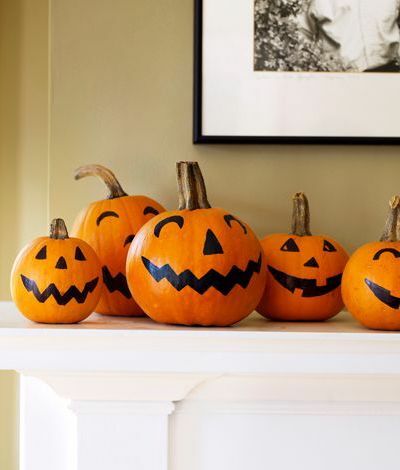 Get into the spirit of the season with this fun and easy Halloween Decorations. Pumpkin carving is an age-old tradition, but a messy one. This year, avoid the mess by trying out no-carve pumpkins. There are dozens of ideas for no-carve pumpkins, with varying levels of difficulty. The easiest include drawing faces with Sharpie markers or putting masks over the pumpkins. Some of the harder include covering your pumpkins with velvet or lace or even bedazzling them with sequins. Whatever you choose, get creative and let your Halloween spirit show! 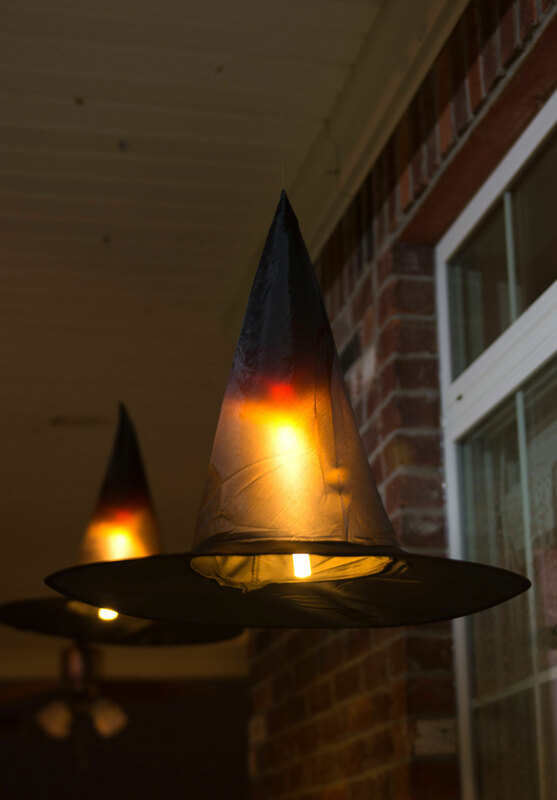 Reminiscent of Harry Potter, these floating witch hats will be popular this Halloween season. All you need are some inexpensive witch hats, fishing wire, hooks for hanging, and LED light sticks. Hang the light sticks inside the hats, and then hang the hats from the ceiling. This can be done both inside or outside your home. These floating hats are the perfect blend of fun and creepy and can be reused for years to come. 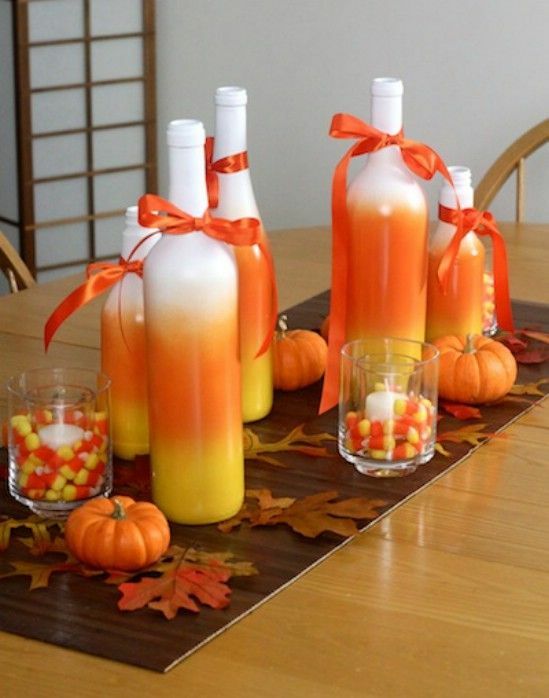 If you have any empty cans or bottles around the house, this is the perfect DIY craft for the season! For the bottles, just remove the labels and spray paint white. Draw faces with a Sharpie marker and you have your own ghostly decor. Or, spray paint with orange, yellow, and white to make them look like candy corn. For the cans, spray paint black both inside and out. Use a hammer and nail to punch out holes, spelling BOO - one letter per can. Make sure you draw it out with a marker or pencil first. Place colored tissue paper behind the letters, and a tea light candle inside. Use a battery-powered candle for safety. Catch the eye of all your guests with a classy pumpkin topiary. For best results, look for pumpkins that are more oval-shaped so they stack better. To prevent them from falling over, secure by sticking a rod or pipe through the entire stack. Place one topiary on either side of your front door for a stunning look. 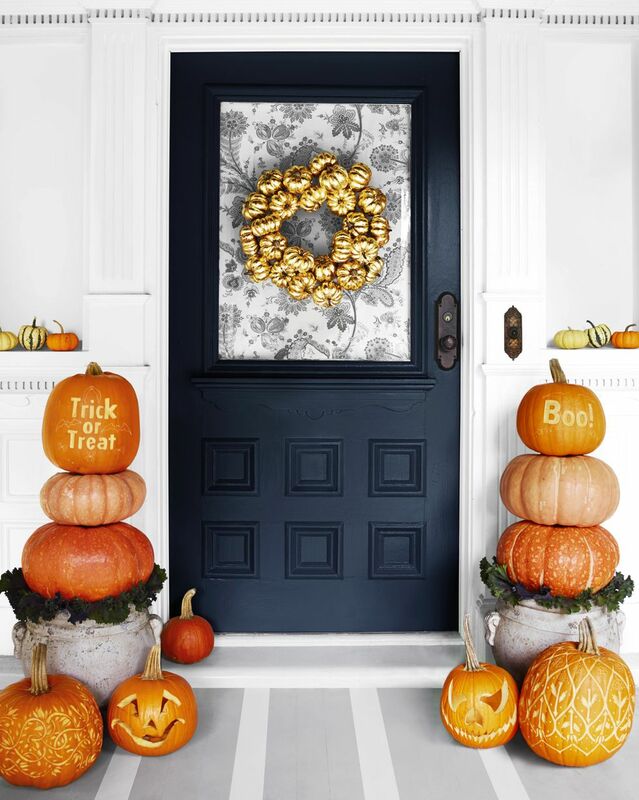 For extra decorations, add a fall leaf garland around the topiary and smaller pumpkins around your porch. Even those afraid of spiders will love these creepy crawlies. Scoop out mini pumpkins and place tea lights inside. 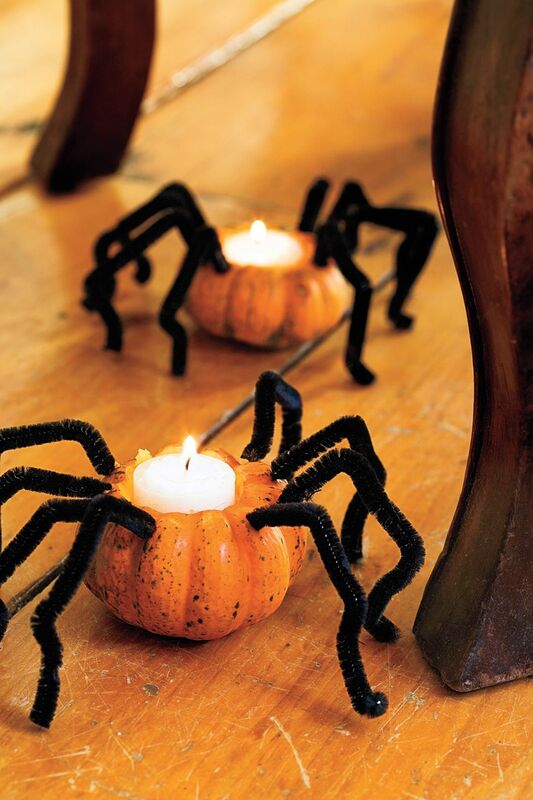 Add black pipe cleaners for legs and place them all around the house. Again, you may want to use the battery-powered tea lights for safety. Not all Halloween decor has to be extravagant. For a simple, yet effective decoration, look towards balloons. 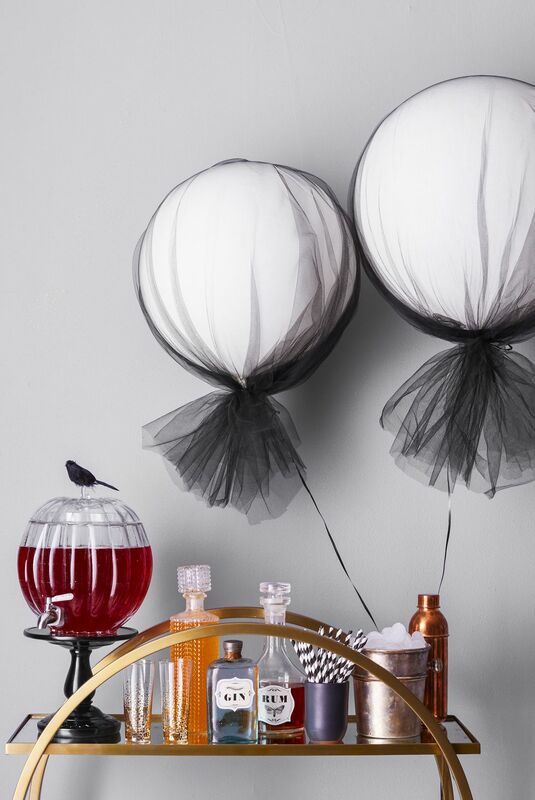 Take large, white helium balloons and wrap them in black tulle. Tie the tulle with a ribbon at the base of the balloon. Place in clusters around your room and you’re ready to party! 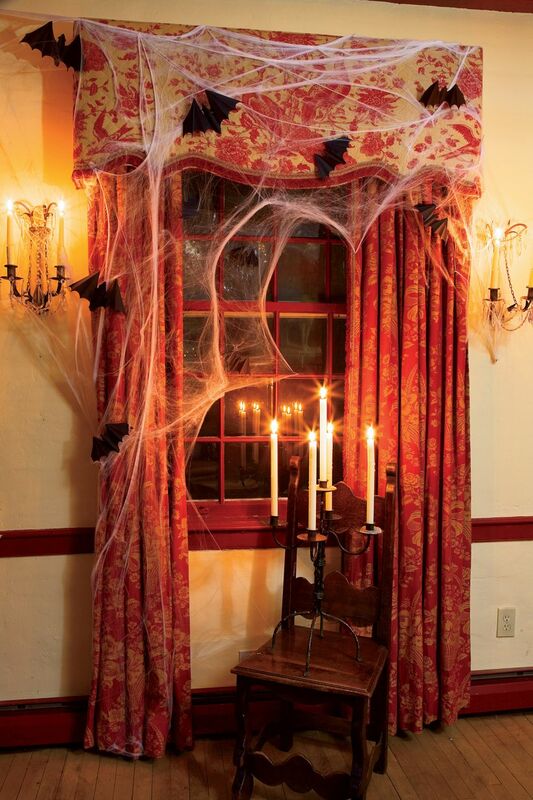 Spiderwebs are a classic Halloween decoration - and for good reason! They are both creepy and very versatile. Small, stretchy spiderwebs can be strung out all over the inside of your house. Place over mirrors or photos, drape from light fixtures, and string from indoor plants. The same can be done outside as well. If you want to go for a bigger scare, add a giant spiderweb extending from the corner of your roof down into your yard. Don’t forget to complete the look with a giant spider! Create old, dripping candles without actually burning your own. Place a styrofoam cup upside down in a small piece of PVC pipe. Drip hot glue all over the pipe using a hot glue gun. Add a tea light candle (real or battery-powered) on top of the cup, and you have your own creepy candle. 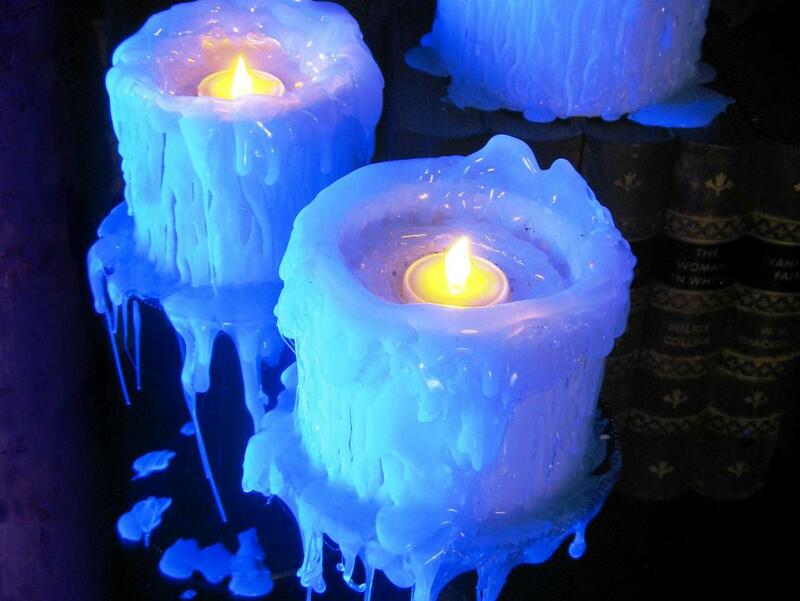 Bonus: these “old” candles will glow under backlight - perfect for any party or haunted house! This is a simple and classy take to the Halloween decor. 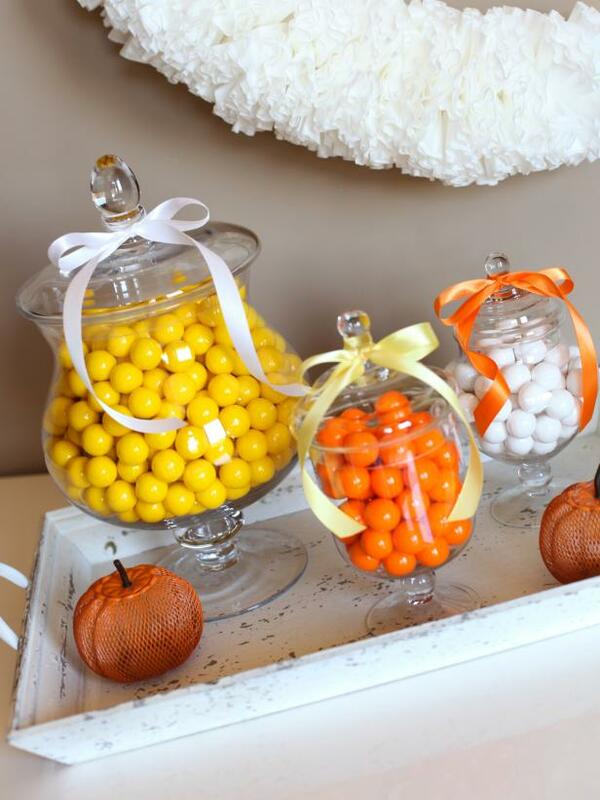 Take jars of various sizes and fill with brightly colored candy. Place around your home and let guests help themselves! Stick to Halloween and autumn colors when choosing your candy. As a style note, this kind of decoration works best the candy in the jar is not mixed. For example place orange colored candy in one jar, yellow in another, etc. Whenever someone says “Halloween,” the first color most people think of is orange. Yet orange is not the only color you can decorate with! Orange can sometimes be bright and overpowering. 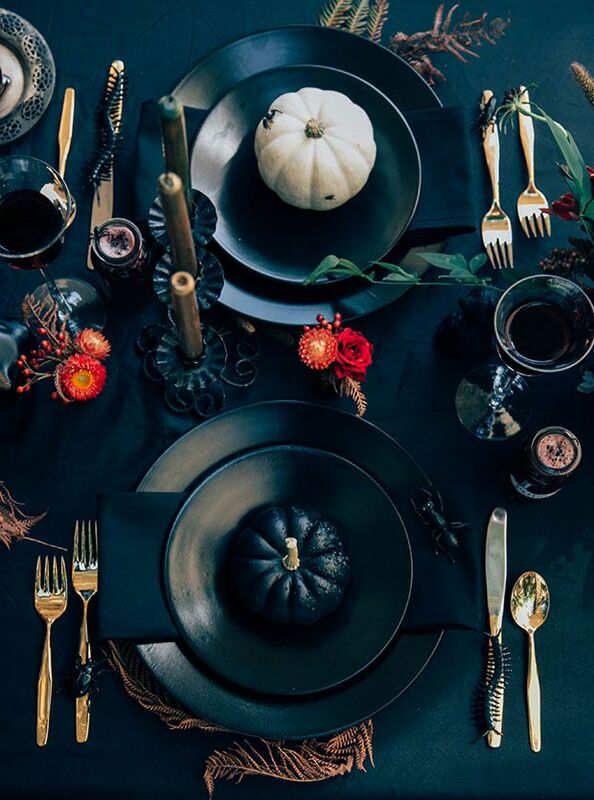 For a spookier feel, stick to all black and gray decorations. Similarly, black and white decorations add a sense of mystery. Metallic accents and antiques will bring old-school glamour and sophistication. And if you still want some color, deep purple is an excellent substitute.